As part of his claim for progressive credentials but also more generally to claim that the likes of Jacques Delors and the privatising António Guterres were part of the grand social democratic Left tradition throughout their working lives, Stuart Holland refers to the Delors White paper – Growth, competitiveness, employment: The challenges and ways forward into the 21st century – which was published on December 5, 1993 as the European Commission’s response to mass unemployment. The White Paper was published in the following context. 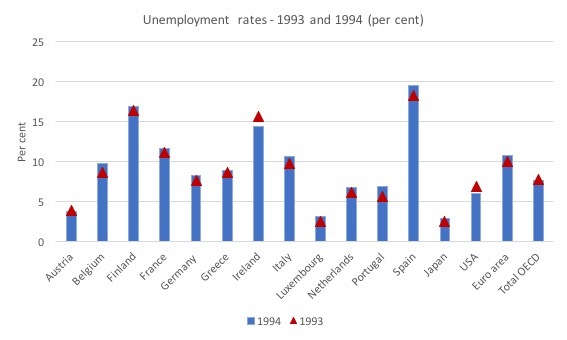 The graph shows unemployment rates in 1993 (red triangles) and 1994 (blue bars) for a selection of nations, mostly comprised on what would become the Eurozone. The data is from the OECD and while the Euro area was not yet in operation the OECD provided estimates post Maastricht of that bloc in addition to the entire OECD membership. I included Japan and the USA for comparative purposes. The point is that mass unemployment was at very high levels in many European nations and was rising between 1993 and 1994 in most. It coincided with a major recession in the early 1990s, which impacted on most nations. However, while, for example, the US began growth again in 1993 and Japan endured its massive property crash at the time, Europe stayed mired in stagnation with elevated unemployment rates. 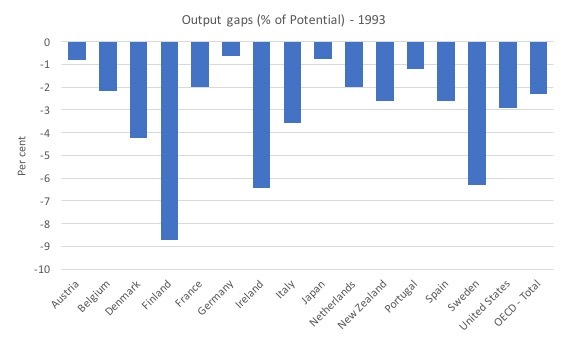 At that point it was obvious that aggregate spending was insufficient and output gaps were large, as the next graph shows. A lot of my own research at the time clearly demonstrated that the rising unemployment was driven by the insufficient aggregate spending. However, that view conflicted with the growing Monetarist (neoliberal) orthodoxy at the time, which was intent on denying the relationship between spending and output and unemployment. This was the period where supply-side biases began to dominate. Where mass unemployment was no longer constructed as a sign of a systemic failure of economies to generate enough work but, rather, as a sign that the unemployed, themselves, were deficient in one way or another – lazy, not prepared, not willing, priced out by trade unions and minimum wages, and all the rest of it. I was an invited speaker at a major European Commission-funded conference in Florence in 1996 and I discussed the Delors White Paper in my presentation. So I know it well. I was one of only a few voices at that meeting that indicated the Maastrict framework would fail and that the approach the Monetarist-infested European Commission under Jacques Delors was taking to the mass unemployment was at odds with logic, and in denial of the evidence before our eyes. By the turn of the century, however, even some of the orthodox camp were starting to turn. For example, the late Franco Modigliani, who introduced the term NAIRU to the economics profession (Modigliani and Papademos, 1975), seriously reconsidered his position. Everywhere unemployment has risen because of a large shrinkage in the number of positions needed to satisfy existing demand. I considered this era in detail in my 2008 book with Joan Muysken – Full Employment abandoned: Shifting sands and policy failures. The Delors White Paper was one of two major statements in the period on mass unemployment and its solutions, the other being the OECD Jobs Study, which was published in 1994. The OECD Jobs Study agenda has become the principle policy framework since the early 1990s among Western government and promoted privatisation, deregulation and massive welfare changes all aimed at weakening trade unions and making the most disadvantaged workers more desperate. The OECD followed the publication of the Jobs Study with almost constant pressure on governments to abandon the hard-won labour protections which provide job security and fair pay and working conditions for citizens. Their endorsement of inflation-first macroeconomic policies where monetary policy plays the prominent role and uses unemployment to discipline the inflation generating process and fiscal policy is largely contractionary left a legacy of persistently weak growth, entrenched high unemployment and rising underemployment. The war on the victims of this folly in macroeconomic policy – the millions of unemployed – gathered pace through the 1980s and culminated in the OECD Jobs Study, which became the bible for those intent on ignoring the fact that the unemployed cannot search for jobs that are not there. The intellectual developments within the European Commission under Jacques Delors mirrored these trends and the Delors White Paper, which Stuart Holland seems to regard as a breakthrough for progressive Left values exemplified how far down the neoliberal track the Commission had gone. … sets out a strategy aimed at enabling the Community to overcome the present recession by means of sustainable development of the European economies which are able to meet the challenge of international competition and re-establish growth in employment. It was prepared as a discussion papter for the European ministers’ summit held in Brussels. It was seen as the European Commission’s first major policy stance to deal with the entrenched mass unemployment. And it was redolent of the orthodox literature of the day (and still) – which goes like this – oh, unemployment is a problem – “We are aware of its scale, and of its consequences too” – but it is a complex issue and – “The difficult thing, as experience has taught us, is knowing how to tackle it”. That was its opening (the quoted passages). The problem is that experience has actually taught us that mass unemployment is a fairly easy thing to solve – you just have to create jobs. And if the private sector is not going to create sufficient jobs, then guess what, the public sector has to create them. Experience teaches us that once the private sector’s spending and saving decisions are taken, if there is mass unemployment then it reflects a choice made by government. Presumably, there is an irreducible residual level of unemployment composed of people who don’t want to work, who are moving between jobs, or who are unqualified. If there is in fact some such residual level of unemployment, it is not one we have encountered in the United States. Never in the post war period has the government been unsuccessful when it has made a sustained effort to reduce unemployment. That is what experience tells us. It also tells us that if national governments are hell bent on running fiscal surpluses or restricting their deficits below some arbitrary rule that restricts their ability to adequately respond to private spending fluctuations then mass unemployment will usually be the result. There was no surprise when unemployment in France skyrocketed after Delors hacked into net public spending in 1982 and again in 1983. Real GDP growth 1.6 per cent per annum in 1992 and by 1993 it had fallen to minus 0.613 per cent. There was nothing structural about that. And if one tracks movements in aggregate spending they bear a very close correspondence with the dynamics of employment growth (in a positive way) and unemployment (in a negative way). The Delors Report largely denied this reality, with only a fleeting mention to cyclical unemployment as being an issue. Instead, its main analysis was how Europe could extend the “single market”, make it easier for “small and medium-sized enterprises” to enjoy less regulation, and to construct “trans-European infrastructure networks” by deregulation, private investment in transport and energy. That is denying the obvious link between growth and employment. Instead, we read that the problem is “inflexibility of the labour market … which is responsible for a large part of Europe’s structural unemployment”. The party line being rehearsed. 2. “greater flexibility in businesses”. 3. “reduction in the relative cost of low-qualified work” – aka wage cuts. We read “on the demand side there is the problem of price” (that is, Delors claimed wages were too high). 4. “on the supply side there is reticence to take jobs” – so workers choose unemployment over “unskilled or semi-skilled work”. Nothing progressive at all in terms of the Member State governments or the Commission’s responsibility to actually create some jobs. For Stuart Holland to even refer to this paper as being something of a progressive Left origin is startling. UK academic, the late John Grieve Smith, who wrote in the old Keynesian tradition, produced a review of the Delors White Paper in in the International Review of Applied Economic (1994, Volume 8, Issue 3) (Source). That the Commission and ministers should at last address themselves seriously to this critical problem is encouraging – although it is noticeable that they do not even pay lip service to re-establishing full employment as a goal … the document …. provides disappointingly little indication that governments are likely to take effective action to tackle unemployment. The White Paper considered the mass unemployment to be structural, which meant that it cannot be reduced by increasing aggregate demand. Grieve Smith said that “This assertion is untenable. At current levels of unemployment there can be little doubt that demand wuld have to rise a long way before the reduction of unemployment began to be affected by the emergence of ‘structural’ problems …. The major weakness of the White Paper is that it fails to recognise that the key problems at the present time are those of demand management and that the immediate questions in tackling unemployment are thus macroeconomic ones. Instead, the report concentrates on what it calls ‘rigidities in the labour market’, which seem to provide a pretext for attacking all forms of legislation or agreements to protect labour, combined with a general call to cut labour costs. The summary of all that is that the Delors White Paper was neoliberal central. It reflected an abandonment to the progressive Left commitment to full employment. It reflected an abandonment of the idea that governments should create sufficient work for all after the private sector has made its choices. It reflected the idea that the unemployed were largely to blame for their own circumstances or that government regulations, minimum wages, and income support schemese were to blame or a mix of the two. It represents the intellectual poverty of our neoliberal time. A progressive Left person would never refer to this Report in any favourable light. And what about the Eurobonds issue that Stuart Holland raises? Well read on a bit. The Delors White Paper Annex is where we learn about the Eurobonds or “Union Bonds” as they were called in the document. Union Bonds’ for growth would be issued on tap by the Union for long maturities to promote major infrastructure projects of strategic interest covering the trans-European networks plus cross-border projects with EFTA, Central and Eastern Europe and North Africa. The beneficiaries would be project promoters (public sector agencies, private companies) directly involved in TENs. The EIB would be invited to appraise and advise the Commission On the overall structure of the fmancial arrangement and act as agent for individual loan contracts. The EIB is the European Investment Bank. In December 1992, the European Council met in Edinburgh and set a ceiling on the Community ‘budget’ of 1.27 per of Community GDP by 1999. This became known as the “Edinburgh ceiling” or the “Edinburgh Agreement”. The new instruments are needed for projects specifically included in the Master Plans and complement the lending of the European Investment Bank, which is more general. The budgetary elements remain within the Edinburgh ceilings. In other words, the Union Bonds scheme was never intended to be part of a federal fiscal capacity that would allow the Member States to receive ‘federal’ assistance in times of hardship. They were specifically intended to help finance the “trans-European networks” rather than mass unemployment. So they were never part of a solution to the inherent design flaws that Maastricht had created in the soon-to-be EMU. Finally, Stuart Holland believes that the claims that the conduct of Syriza during the bailout crises and after is symptomatic of the abdication of the Left are unwarranted. He argues that he, and the then Finance Minister Yanis Varoufakis (later to be joined by James Galbraith) published several versions of what they called the “Modest Proposal” as a solution to Greece’s problems, which were evidence of a progressive Left approach to the problems. A share of the national debt of all member states over the 60% Maastricht limit could be mutualised in the sense of a Eurozone equivalent of a deposit account, which could be serviced by the member states but not drawn on for credit, and therefore would not be liable to downgrading by credit agencies. Note the reference to Delors again – as if he understood all along the folly that the Eurozone became even though he was overseeing and driving the process. By way of background, the ‘Modest Proposal’ is a variant of another debt-mutualisation scheme that emerged in 2010 called the Blue Bond Proposal (BBP) under the guise of Jacques Delpla and Jakob von Weizsäcker. At the time, as the crisis deepened in the Eurozone, these debt-mutualisation schemes started jumping out of the woodwork as if there was no tomorrow. The essence of all these schemes is that a Member State’s public debt would be split into a “Blue Bond” component with “joint and several liability” (under the BBP up to 60 per cent of debt, that is, the allowable maximum under the Stability and Growth Pact, would be pooled in this way) and a “Red debt” remainder, which would be subordinated to the Blue Bonds. In theory, this is meant to lower the funding costs of the Blue component and push up the borrowing costs in the Red component, which the authors claim would provide incentives for Member States to reduce their debt to conform with the Maastricht threshold. Further rules were proposed to tie down governments participating in the scheme, all of which would reduce the options available to Member States and reinforce the austerity straitjacket. For example, the proposal might allow nations such as Germany to add the full 60 per cent of its debt to the pool while nations such as Greece would be restricted to borrowing much lower proportions. Given the immediate problem was (and is) mainly one of default risk, the proposal’s perverse incentives (punish those most at risk) would not seem to be part of any viable solution. The underlying bias in the proposals is that the authors considered that all debt above the Maastricht threshold are due to the pursuit of unsustainable fiscal policies. The BBP authors, for example, claimed that the financial markets failed Greece by “continuing to provide cheap funding while fiscal policy was reckless” (page 2). It was difficult to square this view against the situations of Spain and Ireland, which were models of fiscal rectitude leading up the crisis? Moreover, imagine that the current slowdown in China intensifies and the world is plunged into a further economic spending crisis or that Donald Trump’s trade war results in recession. Under current arrangements, Eurozone public debt levels and fiscal deficits will rise sharply again, even though the governments are locked into the austerity mentality. It is likely that many nations would go beyond the 60 per cent debt threshold given the elevated debt levels already in place following the GFC. The proponents of the BBP stated that the 60 per cent threshold is the “debt level deemed sustainable for any EU member state according to the Maastricht Treaty” (p.6). But in the event of a sequence of slowdowns, exacerbated by the austerity bias, the BBP proposal would punish many nations, even if they were following the mindless fiscal path specified by the Treaty. It is hard to see how that could ever represent a viable solution. All these schemes implicitly deny that the Eurozone is biased towards crisis. And then we come to the so-called “Modest Proposal”, put out by economists Yanis Varoufakis and Stuart Holland, which is just a variant of the BBP scheme. As I wrote in my 2015 book – Eurozone Dystopia: Groupthink and Denial on a Grand Scale – one recalls Jonathan Swift’s satire of the same name, published in 1729, where Irish parents were encouraged to ease their economic travails by selling their children as food to provide culinary pleasure to the rich. The aim of the ‘Modest Proposal’ was to address four “interrelated” problems: a banking crisis, involving banks that are the responsibility of the national governments, who do not have the currency capacity to guarantee deposits; a debt crisis where nations cannot borrow from private bond markets; an investment crisis, where both the level of investment has fallen sharply and the imbalance between the trade surplus and deficit nations has widened; and a social crisis, with high unemployment, rising homelessness and poverty, and falling incomes. Like all the ‘hybrid’ schemes, they are motivated by the assertion is that “a Eurozone breakup would destroy the European Union, except perhaps in name” which would pose a “global danger” (Varoufakis et. al., 2013: 2). Dramatics aside, when assessing the proposal it was hard to see how a scheme that involves no fiscal transfers or changes to the Treaty can provide a lasting solution to the mess. The proposal would never have solved the inherent problems within the Eurozone, which are defined by the very political constraints that the authors recognise force them to adopt these ‘modest’ proposals, in lieu of more effective and lasting solutions. Their debt manipulation proposal was similar to the BBP, outlined above. The obvious question is why bother? The ECB has through its QE programs demonstrated that they can deal the private bond investors out of the equation when it came to setting yields on government bonds. The ECB can effectively set yields at any level it desires including zero, which means that a Member State can only run out of money if the ECB refuses to exercise its power to buy unlimited volumes of the government’s debt. The SMP program kept the Eurozone together, but by imposing austerity as a pre-condition for participation, it failed to address the core problem that Southern Europe is in depression and the only way out is for fiscal deficits to expand. The most direct way forward would have been for the ECB to invoke its OMT facility and facilitate increased government spending. Varoufakis, Holland and Galbraith (2013: 5) acknowledged that the OMT program “has succeeded in taming interest rate spreads within the euro-zone” but conclude that the implicit threat against bond markets, described above, is “non-credible”. Allegedly, bond dealers will eventually call the ECB’s bluff and expose the OMT program as a paper tiger. This criticism is without foundation. How exactly can the private bond markets “test the ECB’s resolve”? (p.5). The ECB has unlimited euro capacity to purchase all the secondary market bonds it desires. To think otherwise is hardly progressive or Left. The belief that the bond markets have the power over the state is core neoliberal thinking. It was also difficult to see the ‘Modest Proposal’ as being consistent with Article 104 of the Treaty if a Member State failed to make payments as agreed. In that case the ECB would have to fund the deficiency, which would be equivalent to offering the prohibited ‘overdraft facility’ to the state. The ‘Modest Proposal’ would also probably promote perverse bond market behaviour and deliver massive corporate welfare to the investment banks. The debt policy would see the ECB take bank reserves out of the system in return for ECB-bonds. It wouldn’t take long for the bond markets to work out that they could ask for a premium on the ECB-bonds and the ECB would be under pressure to concede. With interest rates low, the private banks could then borrow from the ECB to buy the bonds, which would pay a return higher than the short-term cash. I felt the need to respond to the Stuart Holland article because it is a good example of how the progressive, social democratic Left has lost itself in the woods of denial, historical revisionism and plain stupidity. I know the Europhile Left will be tweeting it and feeling good about it because it provides validation for their own cognitive dissonance. But as a view of what has happened over the last 40 or so years within the political Left it definitive – completely losing track of reality.